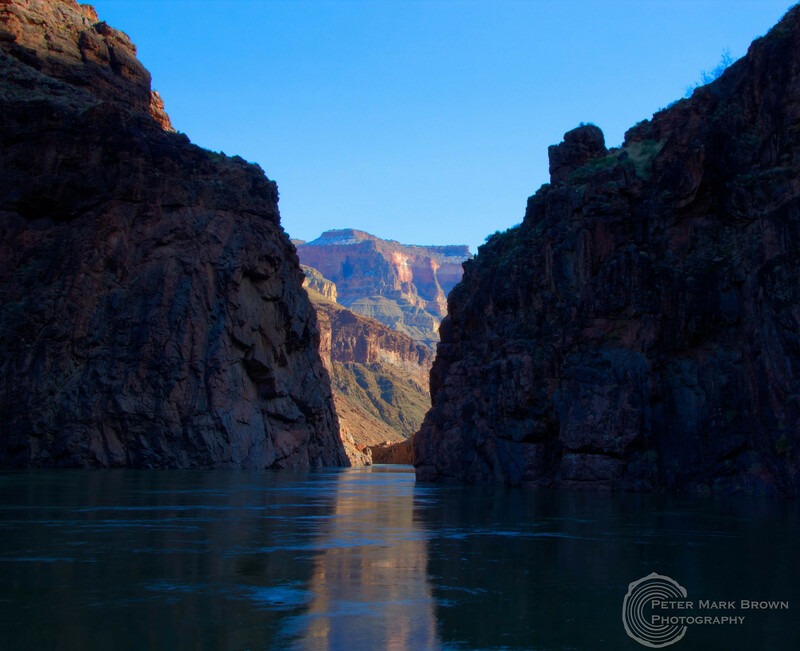 Ever since I was 5 years old I wanted to run the Colorado River through the Grand Canyon. I grew up in Tuba City in northern Arizona until the 6th grade, and the first time I can remember much of anything was seeing the Kolb Brothers movie of their 1911 trip down the River. Emery and Ellsworth Kolb were brothers who opened a photo studio right at the head of the Bright Angel Trail on the South Rim. Their River movie was shown in the studio up until Emery's death in 1976. I distinctly remember seeing that film as a very little kid sometime in the early 1960s and thinking to myself, "I have to do that someday!" And I only had to wait almost 50 years for it to finally happen! All those years never dampened the desire. Lees Ferry, early morning before our launch. I finally had a chance to run the River in 2009. 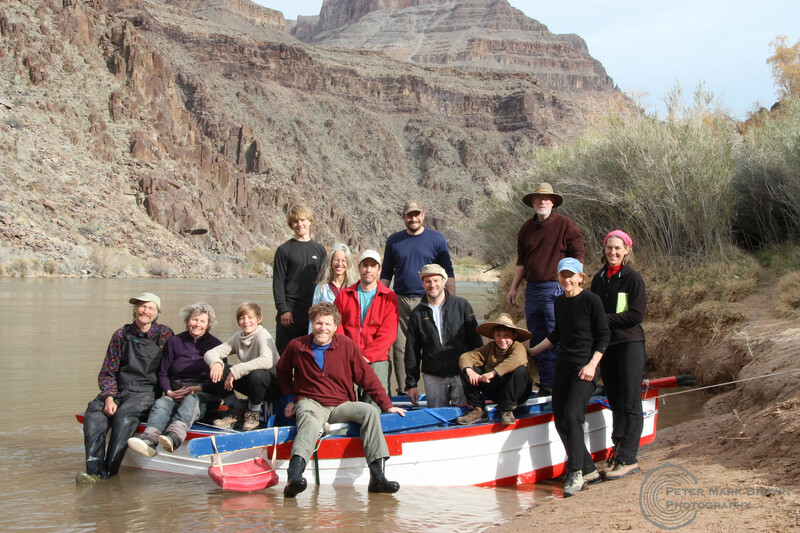 I was invited by my old Tucson buddy Tom Martin - who literally wrote the book on the Colorado River through the Grand Canyon - on a 25-day trip to Diamond Creek launching December 20. It was just incredible to be able to go with Tom, for two reasons. First, some of the best times of my life were spent with him and a bunch of other best friends in high school and early college days in the 1970s. 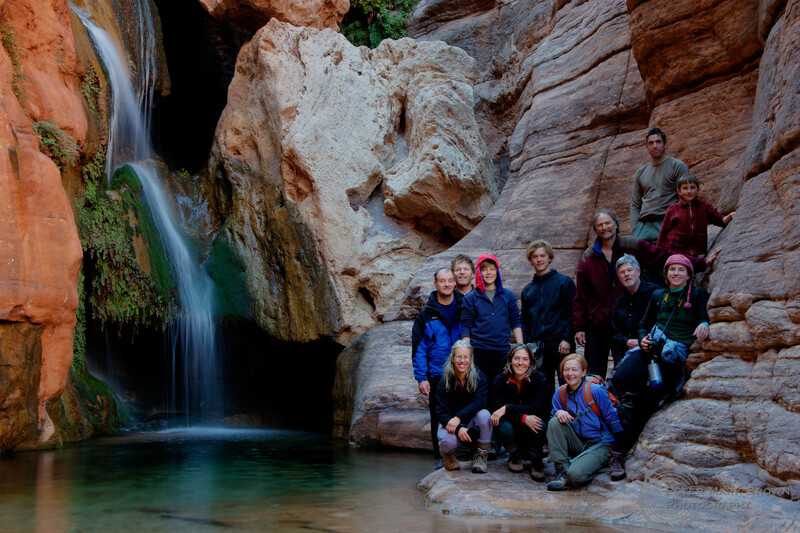 We called ourselves the Sweetwater Gang (most everyone lived on Sweetwater Drive in the Tucson Mountains), and we spent almost all our weekends, vacations, and summers 4-wheeling, camping, hiking, caving, exploring old mines, and climbing all over southern and central Arizona. We knew southern Arizona like no one else. 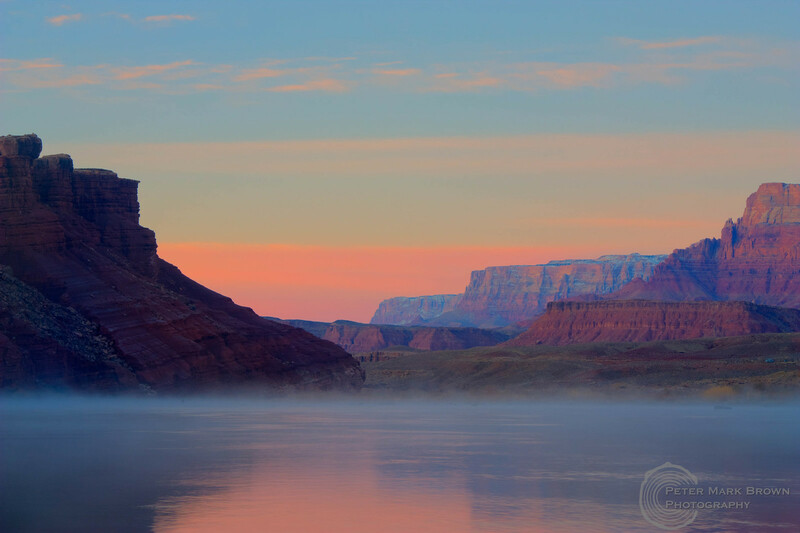 Added to that history was his status as an absolute expert on the River and the Canyon. In addition to his River guide, Tom also wrote a book on 100 day hikes from the River, and we did a few of these on the trip, plus he scouted out some new ones. 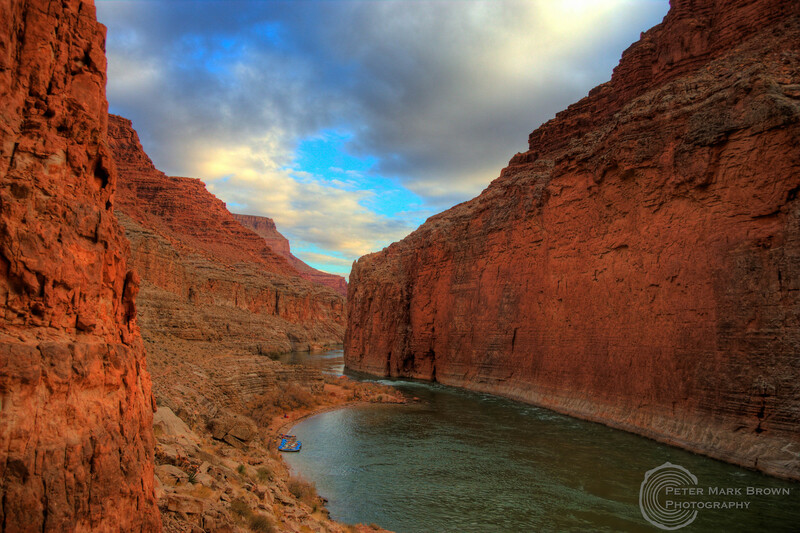 To go on my very first River trip with one of my oldest friends who also knew the Canyon like very, very few people do? What could be better?? Tom and the boat he built, the GEM, a replica of a 1950s era dory that floated the Canyon. You can read all about it in Tom's fantastic book, Big Water, Little Boats, published by him and his wife Hazel Clark's company Vishnu Temple Press. Most of the group at Elves Chasm. In addition to Tom, we had a terrific group on the trip; 13 people on the top half and 14 on the bottom (meaning above or below Phantom Ranch where rafters can hike into or out of the Canyon). A good group really makes the trip, and we had a great one! Tom's wife Hazel came, plus we had a family of four with their two boys, the youngest about 10. Most everyone but me knew each other from various work or play situations. Also on about the fourth day we had a solo rafter join up with us. Sarah had launched the day after we did, and had planned to do the whole trip on her own. But we convinced her to stick around with our merry band (I think it was Tom's presence that did it) and so we were an extra person until about day 20, when Sarah split off again to spend the last few days on the River by herself. Looking downstream from just below the Nankoweep Granaries. We had five 18' rafts that we rented from Canyon REO in Flag, plus this was the maiden voyage through the Canyon of Tom's dory, the GEM. Tom built his boat based on one built by Moulty Fulmer back in the early 1950s. Tom has all the details on the original GEM in his fantastic book, Big Water, Little Boats. The design was well ahead of its day when Fulmer ran the River twice in the mid-1950s, "the last of the wild Colorado" as the subtitle on Tom's book puts it. 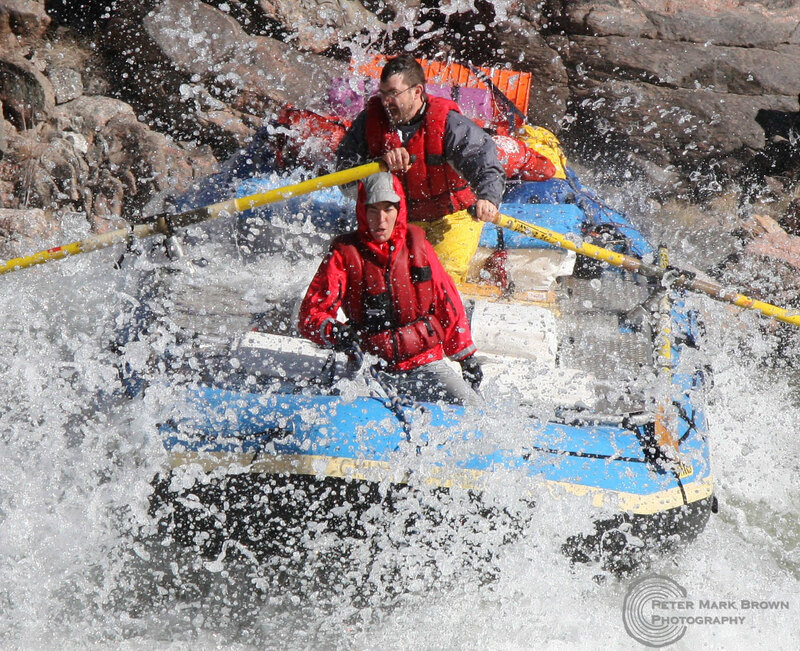 Tom's GEM was a well built little boat, and a hell of a lot of fun in the rapids! It had room for a passenger, and we all had a chance to ride in it during the trip. That boat could literally fly off some of the rollers! And nary a flip nor swimmer from the GEM, although we did have three swimmers total during the trip (I was the first... and not even in a rapid... I'd rather not describe the incident any further... if I was going to swim I would rather it had been in a rapid and instead it was just me falling out of the boat...). 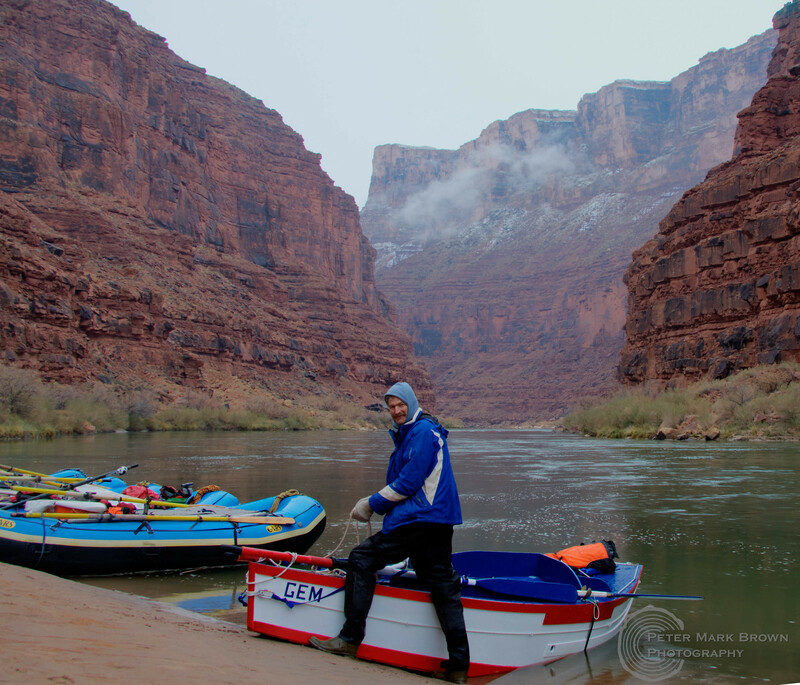 In addition to the boats, Canyon REO supplied all the kitchen and other gear we needed for the 25 day trip, plus packed all the food. Using an outfitter is the only way to go, saves a lot on planning and logistics. That was one of two big surprises for me on the trip, how easy the logistics were by using an outfitter. A main concern of course for a 25-day trip is food planning. REO had each day's meals packed into one rocket box (25 total!) which included detailed instructions for meal prep. At the start of the trip we divided the larger group into threes: one group cooking and cleaning dishes, starting with dinner and continuing through lunch the next day; one group on groover, trash, and water duty; and the third off for the day. The cook crew would break open the day's rocket box and then shop in the coolers for needed items to make the meals. Some of the meals were quite involved, with multiple steps; simpler meals would have been just fine as far as I was concerned. Another issue was there was way too much food; it was difficult to try and save leftovers, so a lot of food ended up in the trash. But no one starved! South Canyon camp, with a massive red wall of Redwall Limestone on the east bank. The following photos (and the one at the top of the page) are a series I took of the rest of the group running Hermit Rapid. I ran it with Tom in the GEM after everyone else had gone through, and it was the only time I had a chance to shoot some rapid photos. I think some of these came out rather nicely. Hermit has a great set of rolling waves, lots of action, and a heck of a lot of fun to both watch and run! 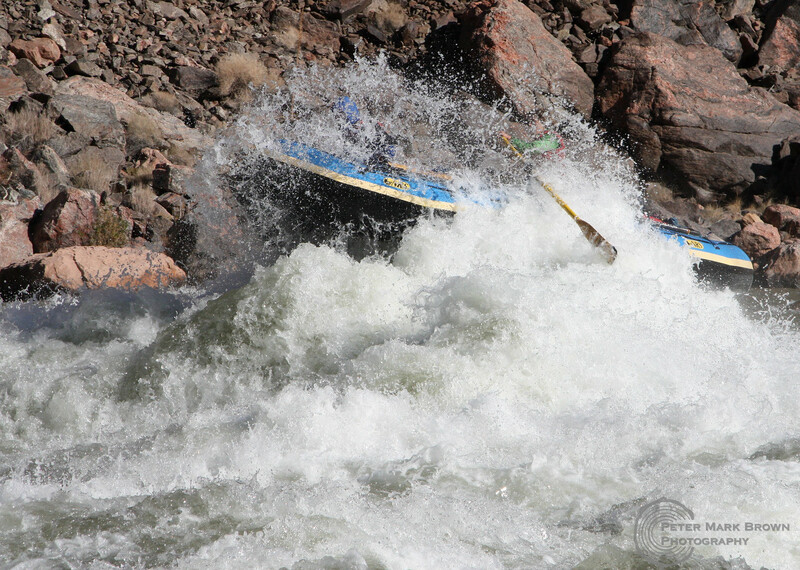 This one says it all, after arriving at the bottom of a rapid with the black side down! Yes, the trip in December was cold, and relatively dark. There are places in the middle of winter where the sun doesn't shine, especially in the mainly east-west trending Inner Gorge. But it certainly was not bad at all. High temperatures most days were in the 40s or even 50s, and it never went much below freezing any night. We did have some heavy frosts, and a few rainy days with snow just above us on the rims. I started the trip sleeping out - no tent - but after about the third night with some rain and frost on the bag in the morning I decided the tent was necessary. There were a few more nights sleeping out (and one under a rock shelter) but most nights I set up the tent. I'm just naturally lazy and the tent was just one more thing to have to pack up in the morning. 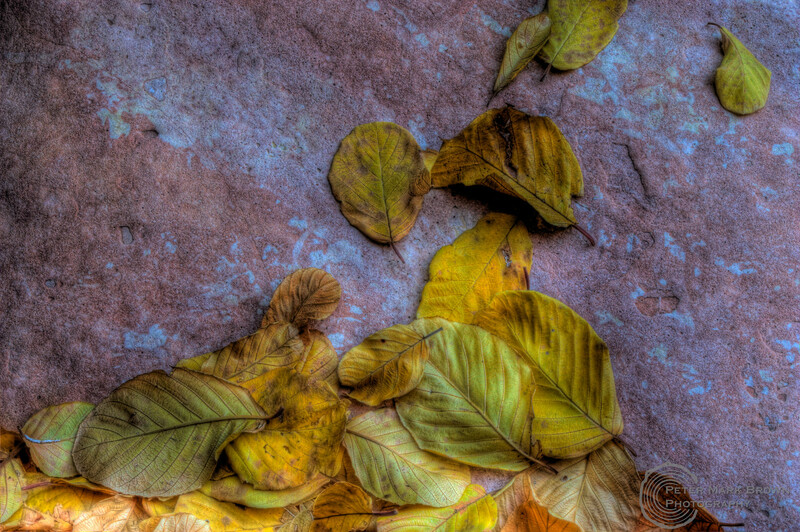 Redbud leaves on rock; these are some of the most beautiful leaves of any tree. One issue came up that led to a fun story. For the first few days there was a full pound of coffee included in each day's food box, and we had a number of coffee drinkers who used the full pound to get nicely caffeinated for the coming day. (Not me; I get my caffeine from tea.) But along about Day 5 the usual pound of coffee was missing, no coffee at all. Needless to say we found this somewhat alarming, not only to those dependent on that caffeine but also to the rest of us that would have to put up with non-caffeinated compatriots! We searched through all the other food boxes and found that many of the remaining days were missing coffee, and in fact there were only about 3 more pounds total for the next 19 days! Panic ensued. We discussed all sorts of options, such as calling for an aerial resupply, hiking up to the rim and then to the nearest Starbucks, caffeine withdrawal and ending it all by jumping off a cliff, etc. In the end we decided to use the satellite phone (supplied by REO) to call one of the folks joining us at Phantom Ranch to bring more coffee down with him. The satellite phone was supposed to be used for emergencies, and we (and I think any coffee drinkers) decided that this most certainly qualified as an emergency. 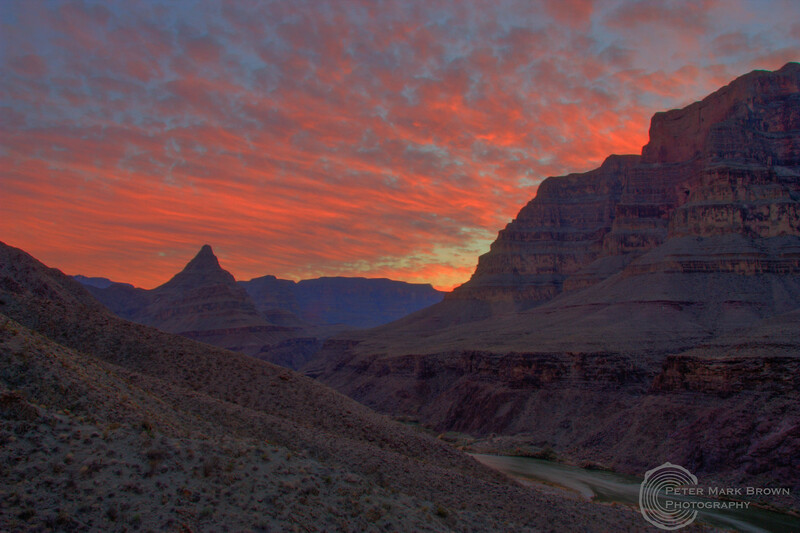 Our relief person said his first thought on receiving a call from the bottom of the Grand Canyon was "this can't be good news!". But he was a major hero when we arrived at Phantom and there he was with an extra 10 pounds of coffee in his pack. Never was a person made more welcome! On the North Bass Trail just above Bass Camp on the River. We did a layover here and I hiked quite a ways up the trail. I hiked both North and South Bass on a 6-day backpack way back in September 1982, and was great to revisit even if only for the day. That was a great trip; I had a friend drop me off at Swamp Point, got a ride on a commercial boat across the River (plus a good dinner and company), then up the South Bass where I finally got a ride into the Village after a long day hiking out on the road. I remember I was getting very low on water; the ride was very opportune. I was much younger then, somewhat dumber too. 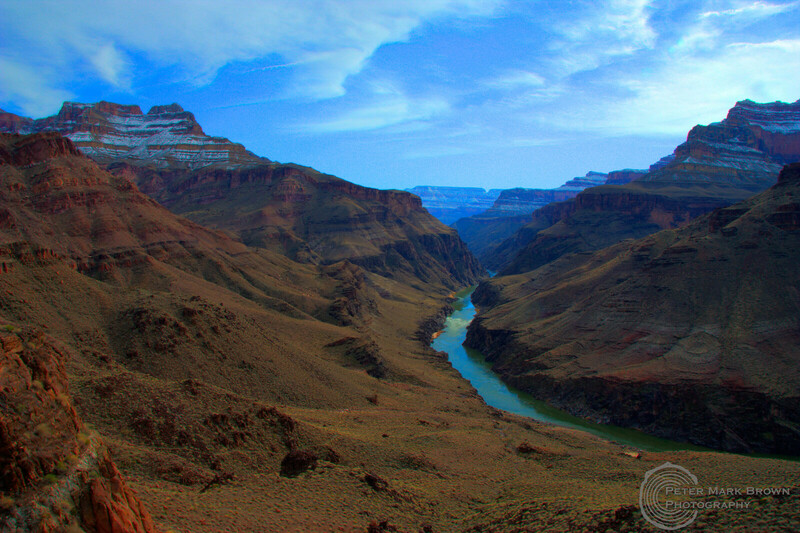 An interesting side-note to our coffee story: John Wesley Powell in his excellent account of the first expedition down the River through the Canyon (actually of two trips, this first one in 1869 and a second in 1871-72), The Exploration of the Colorado River and Its Canyons, describes the end of the trip on August 30 when they finally arrive back in any area with people. On that momentous occasion, Powell writes: "Our arrival here is very opportune. When we look over our store of supplies, we find about 10 pounds of flour, 15 pounds of dried apples, but 70 to 80 pounds of coffee." In contrast to Canyon REO, Powell really knew the importance on insuring there was enough coffee for the entirety of a River trip! 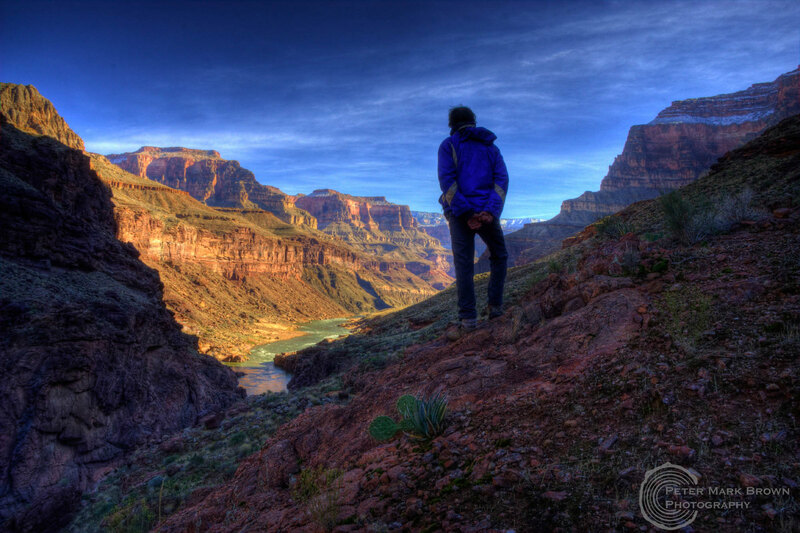 Tom contemplating the Canyon, just above Granite Narrows; this is one of my favorite photos of him. The River in winter, a contrast in light and shadows. Last night on the River, just above Diamond Peak. Just downstream is the Diamond Creek takeout. The trip was everything I had every imagined it to be, and more. 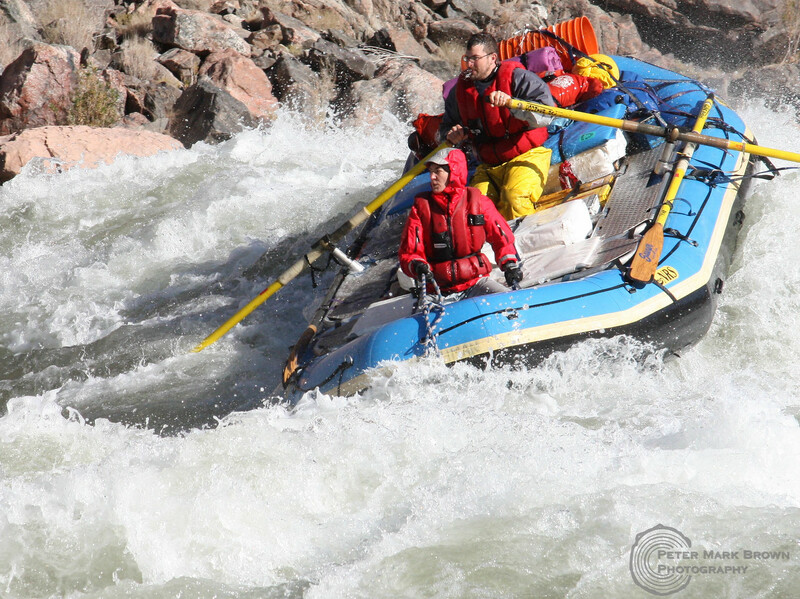 I mentioned above that I was most surprised by two features of the trip: first, how easy the logistics were when going through an outfitter, and second how easy it was to run the rapids. I was just ballast on this trip for the most part, and this later observation is based on watching everyone else. 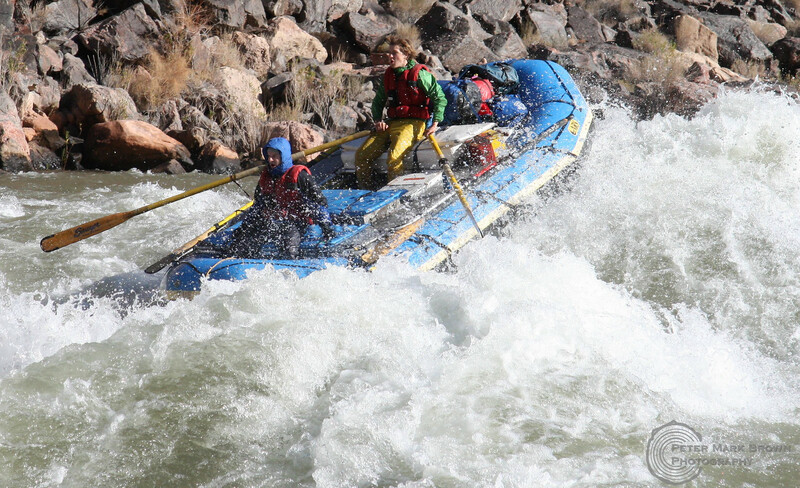 (However, I did row a boat during my second trip down the Canyon, and can confirm that my surprise was not unjustified.) But other than Tom and Hazel none of the other boatmen had ever rowed before. Even Sarah on her solo trip had never rowed a raft before, although she had a lot of kayak experience in eastern rivers. It really helped of course to have Tom along; we scouted all the big rapids, and Tom pointed out where we should go and what to look out for. 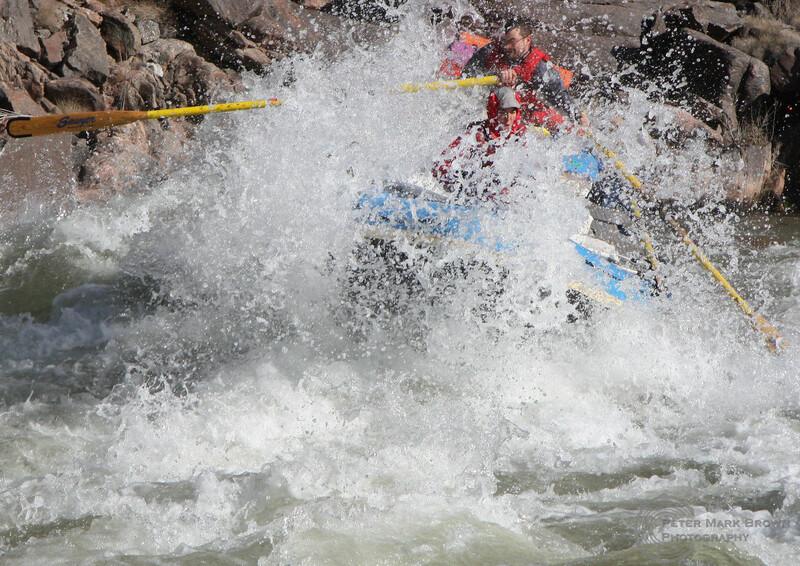 A major part of running rapids is the setup, getting the boat in the right spot before even starting into the rapid. As I mentioned, we only had two swimmers in rapids, which is pretty good record I think for a bunch of mostly neophyte River runners. 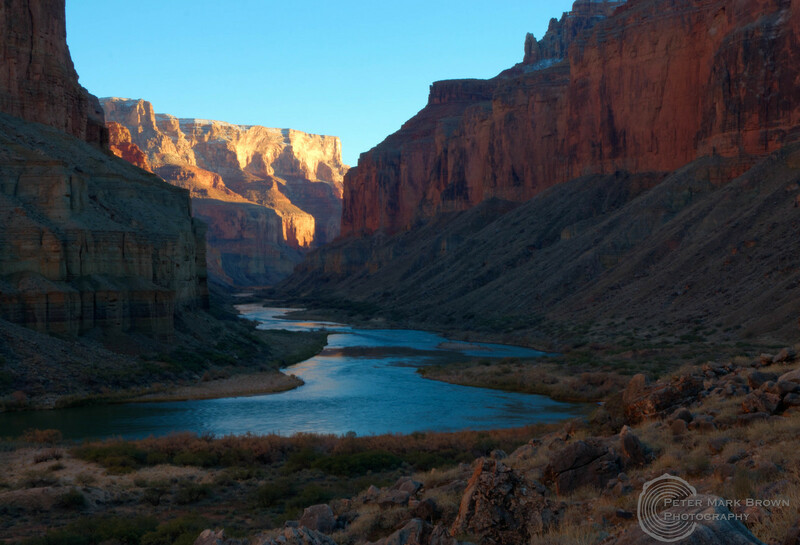 But also just to be back in the Canyon and on the River. I backpacked some in the Canyon when I was younger, although not nearly as much as I should have. It was always a joy to get to the River of course; hot stinking desert above, and then to arrive at cool waters and canyon wrens. There were some hikes along the banks, although those always seemed to come to cliffs that meant the trail had to head away from the River. For example, I did the Thunder River-Tapeats-River-Deer Creek loop twice; the trail starts out from the mouth of Tapeats but then in the Narrows heads up and over the ridge before dropping into Deer Creek above the Patio. But I always wondered - every time- what was just around the corner along the River. It always looked so intriguing, so inviting, so begging for exploration. And to finally have had the chance to go around those corners... Tom, I really thank you again for the opportunity to do this trip, and hope to do again with you some day. Our group at the Diamond Creek takeout. Tom, Hazel, and Myles met up with a couple of others and headed on down to Pierce Ferry for another few days of rafting.